Visitor Number 1,000,000 Wins $500 Today! In a new interview with Wall Street Journal magazine, Jessica Chastain recalled the time she defended herself against her mom’s boyfriend. But the Molly’s Game star has since realized how defining that moment was and how it helped her recognize her own strength (both mental and physical). 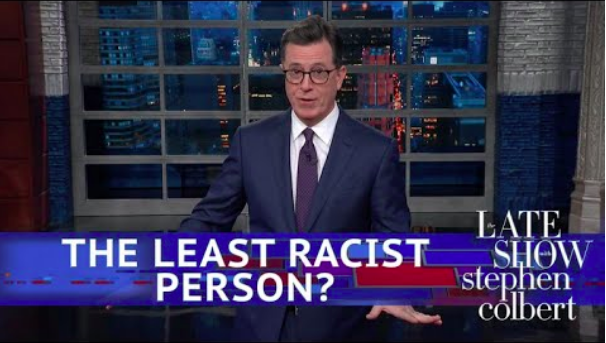 Last night on The Late Show, Stephen Colbert responded to White House Press Secretary Sarah Huckabee Sanders’ reasoning that President Trump isn’t racist because he had a TV show. Before he was president, Donald Trump was the host of The Apprentice on NBC from 2004-2015. The Press Secretary used this logic to explain that Trump couldn’t possibly be the villain his critics are making him out to be. …before going in for the kill. Which Character From “Happy Days” Are You? © 2019 Entertainably. All rights reserved.